Mangaluru, Feb 21, 2017 :Family of 27-year-old Sathish who was declared brain dead after he met with an accident, donate his vital organs. The family came forward to donate the organs Sathish who was declared brain dead. A team of doctors led by managing director of the hospital arranged for the organ donations. Immediately the Zonal Coordination Committee of Karnataka (ZCCK) in turn activated the retrieval team and the recipient list for the organs. 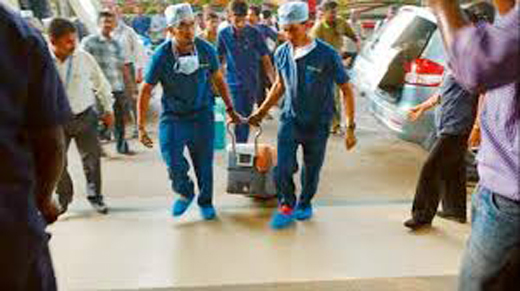 Patient’s heart retrieved at AJ Hospital was taken to MS Ramaiah Hospital, Bengaluru. Liver will be taken to Manipal Hospital, Bengaluru, and one kidney will be handed over to KMC, Manipal, while the other kidney would be transplanted at AJ Hospital. The family of Sathish was to be appreciated for taking the most tough decision in a moment of emotional trauma.